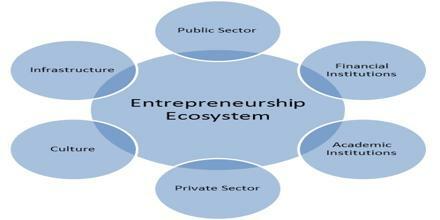 Entrepreneurship Ecosystem is the predominant metaphor for fostering entrepreneurship as an economic development strategy. It refers to the collective and systemic nature of entrepreneurship. It was actually consists of elements that can be grouped into six domains: a conducive culture; facilitating policies and leadership; availability of dedicated finance; relevant human capital; venture-friendly markets for products, and a wide set of institutional and infrastructural supports.